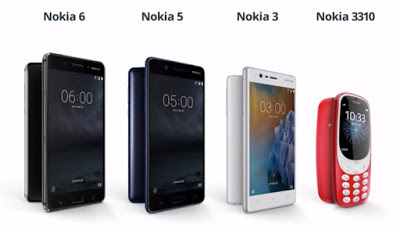 Nokia 3, Nokia 5 and Nokia 6, Nokia 3310 are now available for pre-order at Clove. Nokia 3 is available for pre-order in the Uk for £149.99, and it should hit the shelves on June 30. Nokia 5 is priced to sell for £189.99, and it's expected to arrive in stock on the same day. Nokia 6 costs £229.99 but doesn't have an exact release date. However, just like the other two smartphones, this one will arrive sometime in June. The Nokia 6 is not yet available for pre-order at Clove since the device is exclusive to Carphone Warehouse for one or two months. Nokia 3 sports, a 5-inch HD Display (1280 x 720 pixels) powered by MediaTek 6737, 2GB RAM, 16GB storage, 8MP front and rear camera Device runs on Android 7.0 Nougat. Connectivity-wise, it offers 4G LTE, Wi-Fi, Bluetooth, and A-GPS. It sips juice from a 2,650mAh battery. Nokia 3310 is up for pre-order at Clove for £59.99, much more than we've expected. According to the UK retailer, the Nokia 3310 will ship starting mid-June.